Things happen in life, emergencies come up, interruptions are a given at times, computers crash, internet connections are not always at 100% - life happens and sometimes you just need to 'pause' what you are doing in order to tend to something else. Tests are very important, a lot of time is spent studying for Tests and depending on the length of the Test, a lot of time is also spent taking the Test itself. Nobody wants to take the time to get into a Test only to leave it due to circumstances unseen and not be able to go back to it. You may give quizzes that are lengthy, Tests that can be done at a Test-taker's own pace over time, or in an industry where your users may not be able to complete an exam in one sitting. ClassMarker's Quiz Maker Tool offers the option of having the Quiz be completed in one sitting, as well as our 'Save and Resume Later' option, where users can start a Quiz and then choose to resume this at a later time. When they resume, they will pick up right where they had left off. This option is available when assigning Tests via both Links and Groups. 1) Start Test: Test-takers will click on 'Start Test' when starting a new attempt. They will need to enter a valid email address and create a password. 2) Resume Test: Test-takers would click on 'Resume Test' if they have a Test they have not yet finished, one that is in progress. They will enter their email address and password they created when choosing to 'Start Test'. If a user forgets their password, they can do a password reset to retrieve these details, by clicking on the "I have forgotten my password" link. 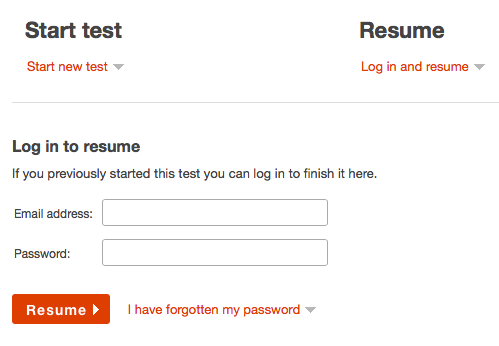 During the Test, there will be a 'Save and Finish Later' button displayed on all Test pages. This will allow a Test-taker to exit the Test at any time while saving their progress. Note: When a Test-taker enters their email and password to use 'Save and Resume Later', this will apply ONLY for that specific Test. They will need to go back to the initial Link or Group they have used to start the Test, in order to resume the Test. Scenario 1. Johnny is using ClassMarker's Quiz Maker for Business purposes. He is in his office doing a refresher Quiz on office policies and procedures. He is notified there is an important meeting he must attend. Johnny will click on 'Resume Test' to save all progress he had done so far. Later on, Johnny goes back to his desk and uses the same Link he had used to start the Quiz, clicking on 'Resume Test'. He enters his email address and password he created when starting his Quiz. This then brings him back to right where he left off. Scenario 2: Sarah is using ClassMarker' Quiz Maker for Education purposes. Sarah is taking an online course which she does from home. Sarah was fortunate enough to not have any interruptions during her Quiz, however, she did study as much as she should have and has failed. She is allowed another attempt, however. Being that Sarah has completed an attempt at her Quiz, when she goes back to the same Link, she will again use, 'Start Test' because her first attempt was completed. 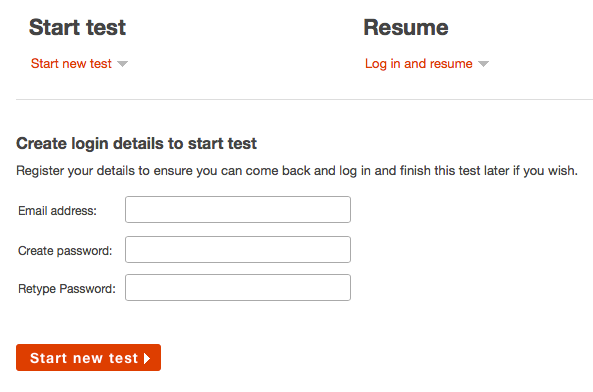 If you are using a Timer with 'Save and Resume Later', the timer will only record the time the user is in the Test. So over a two day period if they log in to the Test 3 times, for 20 minutes each time, the time will be recorded as 60 minutes. Only the time in the Test is recorded. This applies to if a timer is set or not. You can find the 'Save and Resume Later' option on your Link or Group 'Settings' pages under the section 'Taking Test' > subsection 'Resume Later'. For those who have not used the 'Save and Resume Later' option and want their users to complete their Quizzes in one sitting, that's ok too, because we also have another great feature to create a Resume Quiz link, which enables you to easily create a resume link to put your users back into a Quiz that they may have not been able to finish due to a computer crash, connection issue, etc. Register below and see for yourself why ClassMarker is the Best Quiz Maker tool to meet and exceed all of your testing requirements. Register here to begin your 30 day trial with all upgraded features that ClassMarker offers. How do I Assign Quizzes via Links? What do I look for in an Online Quiz Maker? How to Reopen a Completed Quiz? What Quiz Maker Features are Available?